Things to look for in an EL. Things to look for in a J90. First off, don't ask me for bits I don't have any to sell. So you want to own a Cray machine, here are some notes on what to look for. Firstly decide what you want the beast for, either you are going to seriously try to get it going or you are going to break it up and sell the bits for scrap or profit. If you want to sell the bits the older Cray-1, Cray-2 and Model D IOS boards are the most desirable being of reasonable size and quantity per chassis. The later liquid cooled YMP Model E, T3d/e and C90s have large and heavy boards (40 Kg). These could be suitable for making into novelty coffee tables but the shipping will cost big bucks. There have been a couple of the early machines broken up and sold for profit. As of Aug 1998 the T3d/e and T90 machines are still in use at customer sites so older machines are likely to be desirable as parts banks for other systems. T90 boards were the most expensive to build and are of compact size so likely to be desirable for the bits-for-the-mantelpiece trade eventually. The Cray-3 boards have poisonous gallium arsenide (GaAs) in the chips. If you seriously want to get a Cray machine to run for fun, profit or just bragging rights, the ones to aim for are the Air cooled EL-92, EL98 and J90 machines as these will sit in an air cooled room and chew only about 6-10 Kwatts per hour. You will need a chunky power feed, like that suitable for a large electric range cooker, for all except the EL-92 which can run off a normal wall socket. Be sure to check the input power requirement, some machines will be set for European 220 Volts and some for US 110 Volts. Note that ELs may not be Y2K OK at the IO processor level but you might get away with running with the date set to 1990 as there are no time dependant licences in the base Unicos product set. The XMS is just too old and under developed to consider for use. To have any chance of getting system up and running you will need to have either an already bootable system with the IOS, root and usr filesystems intact or a Unicos release tape and the installation document. Els went up to Unicos 8 and J90s to Unicos 10 so try to get as late a version of Unicos as possible. The compiler products came on separate tapes and are licensed so check for those. Get as many of the books (silver loose leaf binders) as possible and look for the Craydoc/Dynaweb Cds that have the books on. The most important books will be the EL and J90 Basic admin guide SG-2416 and the 3 or more volumes of the system admin guide. 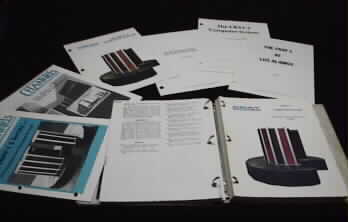 The small silver booklet SQ-2162 Cray EL series IOS commands ready reference is also invaluable. If you are buying from the original owner try to get the service and FCO (field change order) history of the machine. Serial numbers are on a plate at the rear of the machine by the power feed point. The El and J90s were binary release products. You won't find the src for Unicos on board. The big systems came as either src or binary release but as the binary release licence was cheaper most sites moved to that. There should be no problems with export restrictions on all but the T3e and T90 systems but some machines used by government Labs won't have had any import duty paid. Don't get stuck with that bill ! EL and J90 systems are big (wdh 1270 * 810 * 1500 mm) , very heavy ( 640 Kg ), not waterproof but do have wheels on the base. Spares will be hard to find. You have been warned. Boy that is is a toughie ! There are not many around but then again depreciation on a 4..8 year old computer is visicious. The older mainframe machines went for scrap value plus the cost of taking them away just $1000 or so. These days for an EL ? you tell me when you agree a price then I might have some idea. Where IOP and IOBB are must have items. The DD6S may be replaced by other disk controllers. was an optional extra as were any other TC tape controller boards. 1 IOS is normal 2..4 IOS systems are not uncommon. There should be a big twin ribbon cable from the each IOS to the Unicos "Large" boards. Count the number of CPUs and the check size of the memory boards. A system must have all its "Large" Unicos card slots filled in order to run but gaps on the right hand side of the VME card cage are acceptable. Unicos Memory board sizes varied from Mem8 ( = 128 Mbyte system ) to Mem64 ( = 2 Gbyte system ) so look carefully the board markings on the visible edge. Missing CPU slots must have a spacer board installed. The boards are static sensitive so don't handle them at all without full ESD precautions. The early ELs have one vector CPU per board, the later have mother/daughter boards with up to total of 8 CPUs in a system. The disk drive generations went mainly ESDI (0.3GB small old), DD4 ( fast IPI ), DD5s ( 5GB scsi Seagate Barracudas ), DD6s ( 9GB scsi ). There should be at least 1 disk controller per four drives. Some sites attached external scsi discs and used a DD_U generic disk driver but there should be some factory fitted drives in the bays. All external disks have to be formatted with 4k block sizes. Above the IOS there will be a small SCSI IOS disk, a QIC or DAT tape drive and sometimes an Exabyte drive. Be very carefull with the QIC tape deck only push the tapes in slowly until they are grabbed by the device and taken in automatically. They are not like the usual slam and clunk QIC tape decks. These IOS tape devices are connected the IOP scsi port but all other devices will have controller boards in the IOS. You may find an EL that looks like two ( or more ) systems welded back to back. These are quite rare and the extra boxes serve as expansion chassis for IOSs and IO devices. J90 systems have 4 CPUs to a module and a bus plug to enable the odd number of CPUs in the last module. The chassis comes in two ( up to 16 CPUs) or four (up to 32 CPUs) parts pushed together. The IOSs are located in drawers at the front, the CPUs pull out from the rear. Each system comes with a Sun-5 SWS system that acts as the console and NFS mounted IOS boot disk, without the SWS you don't have a viable system. Later J90s have IOS-V "Gigaring" technology. Look for a box(es) with an LCD display and bouncing horizontal Leds on the front that replace the VME cage IOS. The machines are pretty reliable on the whole, the weak spots being the IOP and IOBBs on the ELs and the Y-1 cables on the J90s. The Atomic Museum has framed boards for sale at about USD60 when I last looked. Keep an eye on Ebay, looking just now I see a couple of mugs and posters as well as some boards from a YMP and a whole J90 with a reserve price of USD 8000. There does seem to be a market for Cray manuals and articles. Some pictures of the many Cray branded gifts and promotional items can be found here. This bundle of stuff went for $2,701.00 at Ebay#184054110 on 10/25/99, 15:45:24. Sold by "frknight". (11) An article titled "A High-Performance Graphics System for the CRAY-1," submitted by the LASL to SIGGRAPH 78 - 6 pages. If you have an interest in he historical development, specifications, and operation of the world's first large-scale scientific computer, the one that placed the word "nanosecond" into common usage. Do you have similar stuff for sale ? Be sure to post an auction notice in comp.unix.cray to gather the widest audience for Cray Computer related memorbilia.